Vincent is from OCAC Nigeria and is in the UK at the moment. 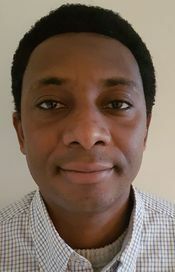 Having studied theology at Attakwu Seminary (part of the University of Nigeria), he is seeking his priestly formation with OCAC UK while he is here with us. He serves in the Metropolitan Parish of London within the diocese of Dumnonia & Wessex. His work is 'reverse' missionary in that he is bringing the love of Jesus back to us...praise God! Vincent's serving is in the caring professions.